Ted Cushman, a freelance writer who is well known in the passivehaus world and who I am a fan of through various social medias, contacted me a few months ago and has since been hanging out on a couple of our projects documenting a few things to various degrees. 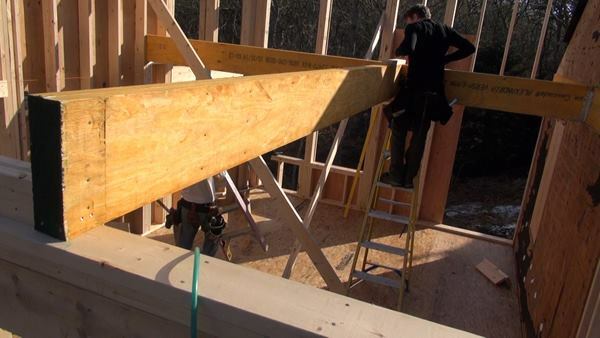 In his latest article he's documenting the beginning stages of the loft framing for this home. Mike Hill, who worked for me for a few years previously and is now out on his own, has been hired for the framing of the 300 SF addition to this home which will feature exposed, finished Douglas Fir beams. After nearly a year of planning with the homeowner and architects, it's nice to see some physical things shaping up here. We should conclude the framing of the addition in a week or two, and then we'll have another six months to completion of the entire larger renovation. In the end, we anticipate this home being a Net-Zero Energy build.